The Philippine Atmospheric, Geophysical and Astronomical Services Administration (PAGASA) released the latest weather bulletin for Super-typhoon Yolanda at 11:00 AM. The PAGASA Weather Bulletin contains weather data obtained around 10:00 in the morning. According to the PAGASA weather bulletin, the eye of Typhoon Yolanda was located about 637 kilometers East of Hinatuan, Surigao Del Sur or 738 kilometers Southeast of Guiuan, Eastern Samar or at approximate position 8.9°N., 132.1°E. According to PAGASA’s hourly updates, Typhoon Yolanda is at 644 km Southeast of Guiuan, Eastern Samar. This update was issued around 1:00 in the afternoon. PAGASA weather bulletin further states that Typhoon Yolanda has maximum sustained winds of 215 kilometers per hour (kph) near the center and gustiness of up to 250 kph. PAGASA reports that the center of Typhoon Yolanda will hit Guiuan. The typhoon is expected to pass through the Philippines in roughly following order: Leyte, Biliran, Northern tip of Cebu, Iloilo, Capiz, Aklan, Romblon, Semirara Island, Southern part of Mindoro and Busuanga. 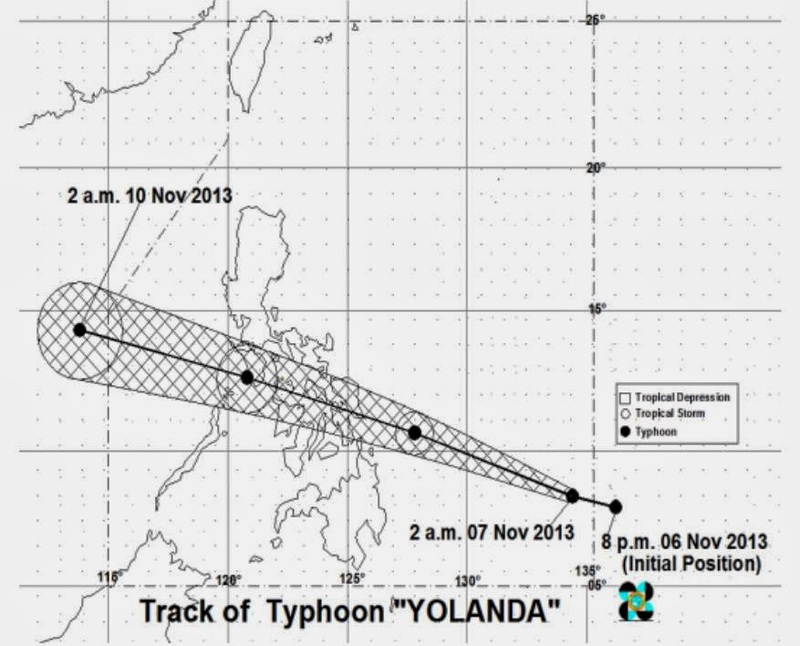 It will exit the Philippine landmass on Saturday morning towards the West Philippine Sea. 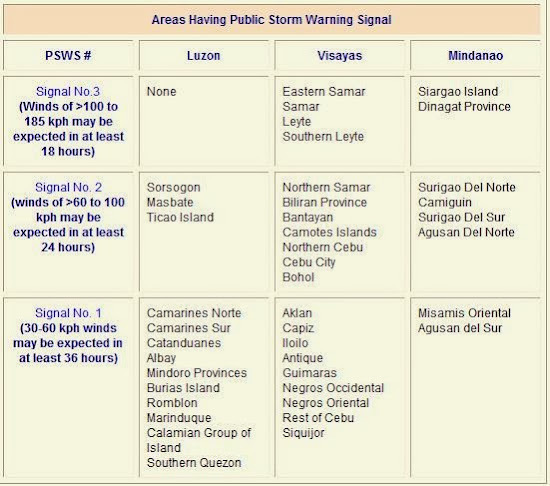 Here is the list of places in the Philippines that has Public Storm Warning Signal (PSWS) according to PAGASA. For information about Typhoon Yolanda, please visit the PHIVOLCS website.